Readers Digest Christmas Album "Joyous Music for Christmas Time"
Readers Digest 4 L.P. 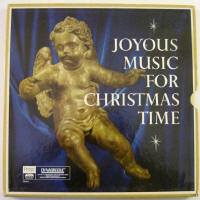 Box set "Joyous Music for Christmas Time"
catalog #RD 22-K, released 1963 or later. Recording engineer: K .E. Wilkinson. This album set is not dated so establishing a release year is difficult. The "Dynagroove" logo on the box dates the set to 1963 or later. Record No 1 - "Carols for Chorus"
1- Joy to the World. 2- O Little Town of Bethlehem. 3- Deck the Halls with Boughs of Holly. 4- Away in a Manger. 5- God Rest You Merry, Gentelmen. 6- Angels We Have Heard on High. 1- O come, All Ye Faithful (Adeste Fideles). 2- We Three Kings of Orient Are. 3- The Twelve Days of Christmas. 4- O Holy Night (Cantique de Noel). 5- It Came Upon a Midnight Clear. 6- Hark! The Herald Angels Sing. Ealing Grammar School Boy's Choir. John McCarthy, Chorus Master. Peter Knight, Conductor. Side 1 - "Christmas Suite for Orchestra". Richard Benson and his Orchestra. Side 2 -"Christmas Music for Organ and Bells". 4- O Come, O Come, Emanuel. 6- Carol of the Bells. Leslie Pearson, Organ. London Bell Ringers. John Paice, Carrillon Westminster Brass Ensemble. Record No 3 - "Highlights from Handel's Messiah". 1- And the Glory of the Lord Shall Be Revealed. 2- Comfort Ye My People / Air: Every Valley Shall Be Exalted. 3- For Unto Us a Child is Born. 5- He Shall Feed His flock / Come Unto Him. 6- And He Shall Purify. 1- Behold the Lamb of God. 2- Air: He Was Despised and Rejected of Men. 3- Air: The Trumpet Shall Sound. 4- Air: I Know That My Redeemer liveth. London Philharmonic Orchestra, London Philharmonic Chorus, Heather Harper, Soprano. Norma Procter, Contralto. Richard Lewis, Tenor. John Holmes, Bass. John Pritchard, Conductor. Record No 4 - "Carols We All Know and Love"
3- What Child Is This? 4- I Heard the Bells on Christmas Day. 5- The Birthday of a King. 6- Good Christian Men, Rejoice. 7- Angels from the Realms of Glory. 1- I Saw Three Ships. 2- O Come, Little Children. 3- While Shepherds Watched Their Flocks. 4- The Holly and the Ivy. 6- Break Forth, O Beauteous Heav'nly Light. 7- Once in Royal David's City. 8- We Wish You a Merry Christmas. The Ambrosian Singers. Jean Allister, Contralto. Leon Goossens, Oboe. Marie Goossens, Harp. John McCarthy, Conductor.